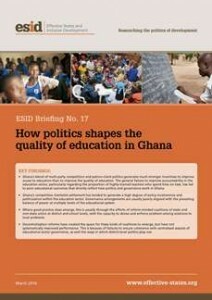 Allocation of resources in Ghana’s education sector plays a political as well as a developmental role. Education is seen by Ghana’s ruling elites as critical to their legitimacy and to their ideas of promoting national development, with increasing incentives for politicians to directly influence the sector. This briefing focuses on education delivery and performance management at the district level. It looks particularly at how some districts have managed to overcome the effects of competitive clientelism and contradictory governance arrangements. Where incoherent governance arrangements fail to generate improvements, reform-minded coalitions of state and non-state actors are required.